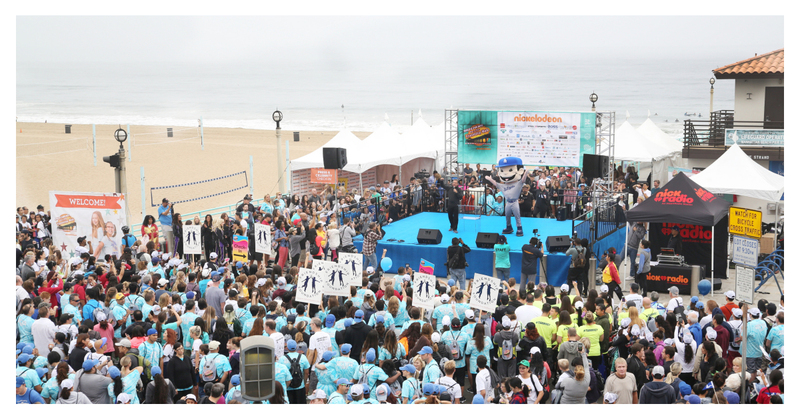 MANHATTAN BEACH, Calif.–(BUSINESS WIRE)–The Skechers Foundation plans to break all donation and attendance records on October 28th at the organization’s 10th annual Skechers Pier to Pier Friendship Walk, California’s largest in support of children with special needs and education. Backed by presenting sponsor Nickelodeon and media sponsor NBC4 Southern California, the Walk has topped donations every year since its inception, and is expected to continue its winning streak and surpass $2 million for the first time in the event’s history. “At Nickelodeon we celebrate all kids, and all of the wonderful characteristics that make them unique, which is why we are proud to support the Skechers Pier to Pier Friendship Walk and the important work this event will fund,” said Jennifer Tracy, senior vice president of Partner Marketing at Nickelodeon Velocity. The Skechers Pier to Pier Friendship Walk is a primary contributor to The Friendship Foundation, an organization that assists children with special needs and their families through one-on-one peer mentoring and social recreational activities such as summer camps, outings to sporting events and a variety of classes that include music, yoga, cooking, art and drama. In addition to educating, inspiring and connecting children who have special needs with their community, the Walk also helps education foundations maintain and enhance their schools; improve technology, science labs and libraries; revamp music programs; reduce class sizes and protect teachers’ jobs. The Skechers Foundation’s scholarship program also awards $100,000 annually to exceptional students who have shown financial need and excellence in academics, athletics and leadership. Since its inception, the Walk has grown from approximately 1,000 people in attendance who raised $220,000 in 2009 to more than 13,000 walkers and participants donating $1.8 million in 2017. The event has also amassed a team of loyal celebrities, including Sugar Ray Leonard and Brooke Burke who are returning for the fourth and eighth time, respectively, and sports legend Tommy Lasorda – a Skechers Pier to Pier Friendship Walk board member who helped launch the event with Michael Greenberg and has attended every year since its inception. The 3.4-mile Walk will begin at the Manhattan Beach Pier at 9AM, where participants will walk to the Hermosa Beach Pier and back. To register or make a donation, visit skechersfriendshipwalk.com or follow SKECHERS on Facebook (facebook.com/SKECHERSFriendshipWalk) and Twitter (twitter.com/SkechersP2PWalk). In addition to headlining sponsor Nickelodeon and media sponsor NBC4 Southern California, the Skechers Pier to Pier Friendship Walk thanks its sponsors that include: The Claudette & Ethan Rickett Care Foundation, Steel Sports, Ross Stores, Moose Toys, Continental Development, Vertra Suncare, JR 286, and more than 100 other companies who have supported our children. Skechers USA, Inc., based in Manhattan Beach, California, designs, develops and markets a diverse range of lifestyle footwear for men, women and children, as well as performance footwear for men and women. Skechers footwear is available in the United States and over 170 countries and territories worldwide via department and specialty stores, 2,715 Skechers Company-owned and third-party-owned retail stores, and the Company’s e-commerce websites. The Company manages its international business through a network of global distributors, joint venture partners in Asia and the Middle East, and wholly-owned subsidiaries in Canada, Japan, throughout Europe and Latin America. For more information, please visit about.skechers.com and follow us on Facebook, Instagram, and Twitter. This announcement contains forward-looking statements that are made pursuant to the safe harbor provisions of the Private Securities Litigation Reform Act of 1995. These forward-looking statements include, without limitation, Skechers’ future domestic and international growth, financial results and operations including expected net sales and earnings, its development of new products, future demand for its products, its planned domestic and international expansion, opening of new stores and additional expenditures, and advertising and marketing initiatives. Forward-looking statements can be identified by the use of forward-looking language such as “believe,” “anticipate,” “expect,” “estimate,” “intend,” “plan,” “project,” “will be,” “will continue,” “will result,” “could,” “may,” “might,” or any variations of such words with similar meanings. Any such statements are subject to risks and uncertainties that could cause actual results to differ materially from those projected in forward-looking statements. Factors that might cause or contribute to such differences include international economic, political and market conditions including the challenging consumer retail markets in the United States; sustaining, managing and forecasting costs and proper inventory levels; losing any significant customers; decreased demand by industry retailers and cancellation of order commitments due to the lack of popularity of particular designs and/or categories of products; maintaining brand image and intense competition among sellers of footwear for consumers, especially in the highly competitive performance footwear market; anticipating, identifying, interpreting or forecasting changes in fashion trends, consumer demand for the products and the various market factors described above; sales levels during the spring, back-to-school and holiday selling seasons; and other factors referenced or incorporated by reference in the Company’s annual report on Form 10-K for the year ended December 31, 2017, and its quarterly report on Form 10-Q for the three months ended June 30, 2018. The risks included here are not exhaustive. Skechers operates in a very competitive and rapidly changing environment. New risks emerge from time to time and the companies cannot predict all such risk factors, nor can the companies assess the impact of all such risk factors on their respective businesses or the extent to which any factor, or combination of factors, may cause actual results to differ materially from those contained in any forward-looking statements. Given these risks and uncertainties, you should not place undue reliance on forward-looking statements as a prediction of actual results. Moreover, reported results should not be considered an indication of future performance.